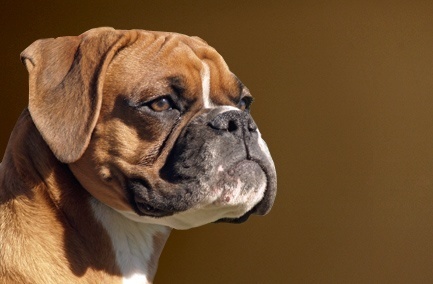 The Boxer is a medium-sized, sturdy dog, of square build with short back, strong limbs, and short, tight-fitting coat. Instinctively a “hearing” guard dog, his bearing is alert, dignified and self-assured, even at rest. His behaviour should exhibit constrained animation. His temperament is fundamentally playful, yet patient and stoical with children. Deliberate and wary with strangers, he will exhibit curiosity, but most importantly, fearless courage and tenacity if threatened. Coat short, shiny, lying smooth and tight to the body. The colours are fawn and brindle. Fawn in various shades from light tan to stag red or mahogany, the deeper colours preferred. Similar to Boston Terriers in their jubilant, clown-like personalities, except that Boxers never grow up! Despite their high rates of skin cancer, heart disease and eye problems, they remain a popular and predictable family dog.